SD9987 0963. High on the windswept Pennine moors to the north of the A62 where Bleak Hey Nook lane intersects with Dirty lane is the area called Castle Hill, Standedge, on the borders of greater Manchester and west Yorkshire. And, located between the two reservoirs (upper and lower), are the rectangular-shaped earthworks of the Roman fort of Castleshaw, known to the Romans as RIGODUNUM – ‘the royal fort’ or ‘the king’s fort’ – the name Castleshaw is of Celtic origins. But long before the Romans settled here at Castleshaw the site was known to have been a Brigantean settlement, later becoming just a little bit of the Roman province of Brittannia. 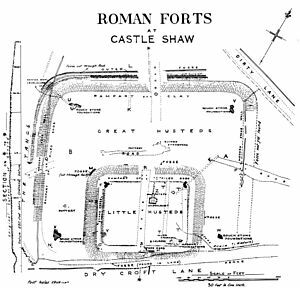 The Romans built the fort here during the Flavian period c79 AD in order to protect their newly constructed road between Chester (Deva) and York (Eboracum) from the Brigantes tribe who had held the area. Upto 50 roman auxiliary soldiers of the Spanish Cohors III Bracaraugustanorum regiment from Lusitania in northern Portugal were stationed here, the rest of the cohort were quartered at MAMUCIUM (Manchester), 10 miles away to the south-west. One wonders what these hardy Spanish soldiers thought to the often bleak weather conditions here on the Pennine moors. The auxillary fort or ‘fortified encampment’ at Castleshaw measured 380 x 330 feet including the outer vicus, but less than that (360 feet by 300 feet) inside the defences or ramparts – the whole site covering between 2-3 acres (1-2 hectares) in total. Constructed from turf, clay and timber, it has an outer ditch measuring 5 feet wide at the rampart with an outer, smaller ditch. There were two main entrance gates at the western and eastern sides, probably double gates made from local timber and a smaller entrances at the north side; at each of the four corners of the fort there may have been watchtowers? – although only one post hole has been excavated. 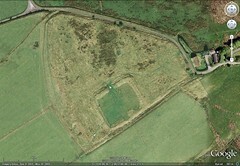 In 90 AD the fort was abandoned for a temporary period, but in 105 AD it was re-occupied and turned in to a fortlet. It was finally abandoned in 120 AD. The buildings inside the fort included a granary at the northern side, a barrack block at the east side, principia and praetorium in the central area and, also various storerooms or workshops at the south-west corner, while outside the fort, at the south side, the “vicus” was the civilian settlement where the families of the soldiers would have lived. There are traces of earthworks at this side and also at the north side but no proper archaeological excavations have taken place either outside the fort or, indeed, inside. I understand that Roman soldiers were not allowed to be married! Categories: Castleshaw Roman Fort, Roman Sites | Tags: Castleshaw Roman Fort at Standedge in Greater Manchester/West Yorkshire, Roman Sites | Permalink. Hi I particularly like the information about Roman Sites. Your selection of the less well known sites is especialy commendable as it adds to our knowledge. You seem to have put a lot of time and effort into the write ups on your site and I like the way you have set out each web page with photographs and drawings. Although your interest is clearly with prehistory and the post Roman Period I will look forward to seeing more about the Roman Period on this site. Thank you Barry, glad you like the Roman section. I will add to this in due course. But thanks for the very kind comment. Feel free to add more comments on all the sites which can be clicked on at the right-hand side of the page. Ray.